It’s not often you see mobile game reviews on our website but it’s also not often I discover a game, a good game, in the same genre as a game I have just finished reviewing. 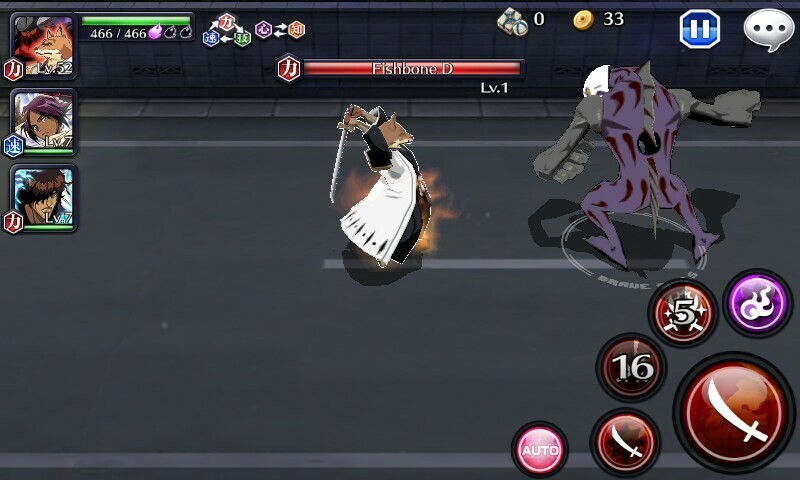 The sitch (situation for you straight and narrow types) is this: I’d just finished playing BlazBlue Chronophantasma Extend (read the review here) and I was doing some background reading about it when I came across the free to play mobile game Bleach, a little known mobile game from the people at KLab Games. 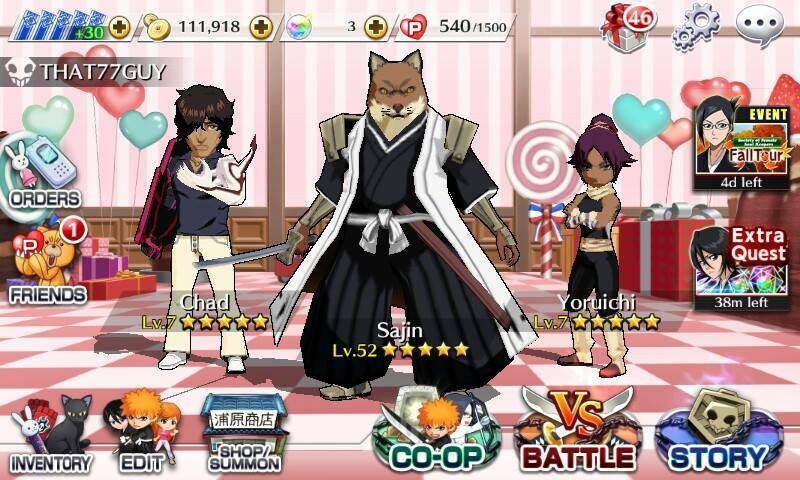 The games share a commonality in Anime but whereas BlazBlue began life as a game, Bleach was the opposite. 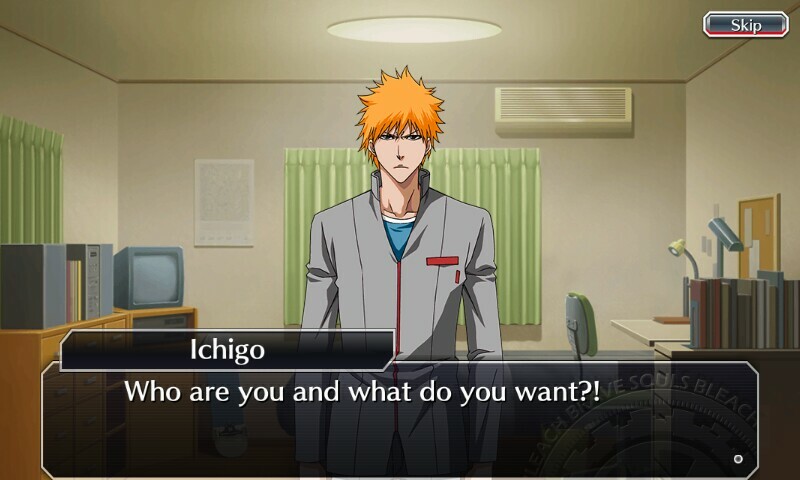 Bleach started its life as a manga which found its way on Western screens as an anime series, evolved into some movies then finally ended up as an action videogame on a variety of consoles and hand-held systems. 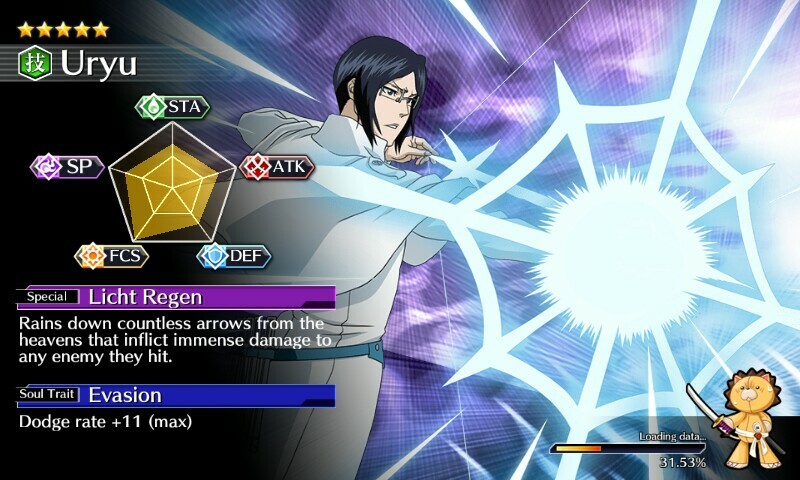 Bleach: Brave Souls is the latest in the series and the first on a hand-held system since Bleach Advance on the Game Boy Advance. 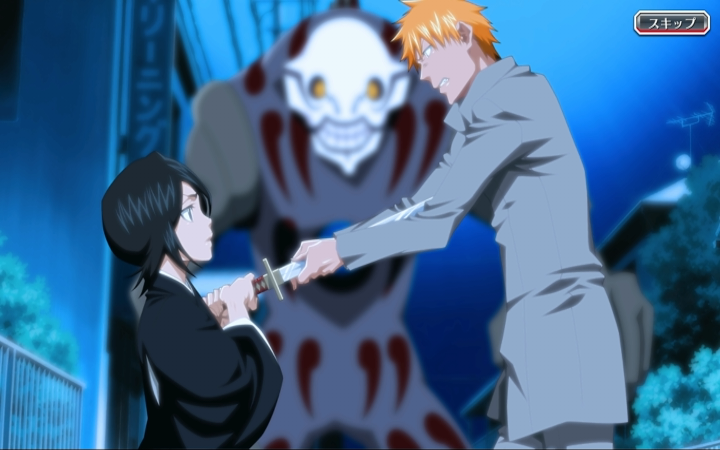 Bleach follows the story of Ichigo Kurosaki, a school boy who becomes a ‘Soul Reaper’ (the Japanese word literally translates to Death God) – a Grim Reaper like character – after absorbing the powers from another Soul Reaper, Rukia Kuchiki. 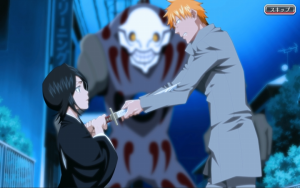 Against his better judgment, Ichigo embarks on a journey of guiding souls into the afterlife as a substitute Soul Reaper, along the way discovering that loads of his classmates have powers of their own. 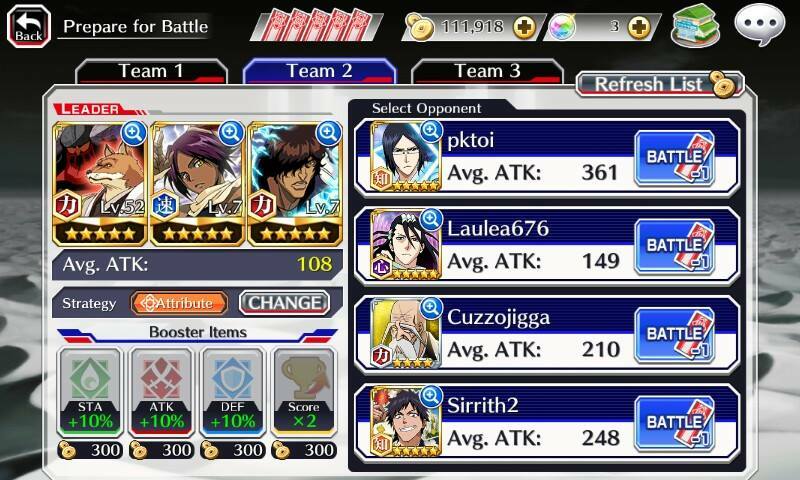 Amongst such classmates are Uryu, (a Quincy, the natural enemy of the Soul Reaper), Orihime (some sort of spirit witch thing) and ‘Chad’ (a Fullbringer with amazing strength whose real name is Yasutora Sado). 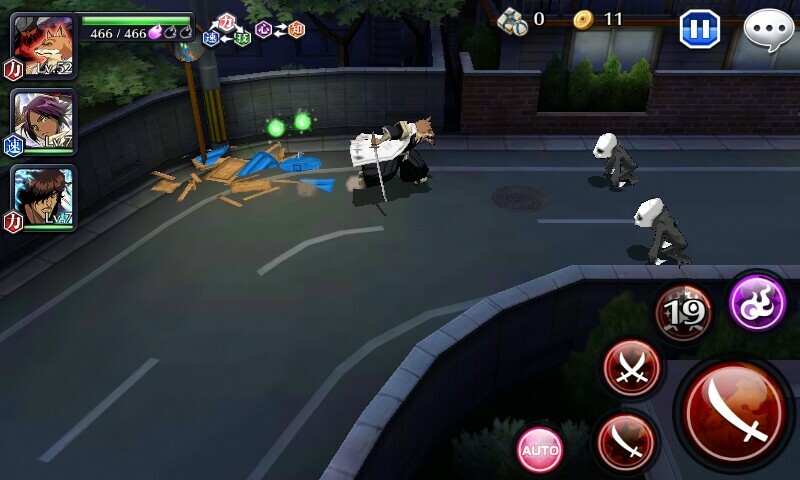 Together these characters battle ‘Hollows’ (basically soul monsters) in order to defend the human race. Players will have to battle through episodes, or quests as they’re called in the game, and within each quest you get a bit of story before you take on Hollows in the street. Gameplay is pretty straight forward: you move your character to the side and press the attack button to fight, certain characters have special attacks which, after being used, have a cool down period before you can use them again. For lazy gamers there is even an auto button that, when activated, does everything for you; it moves, attacks Hollows and even collects items for you. Why this is an option I’m not sure but I will admit, I have used it when things got a bit monotonous. 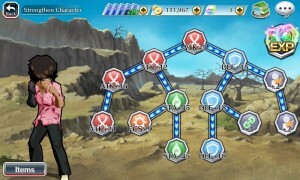 Three characters can be taken into a quest and by pressing the characters button to the left, you can tag them in to the fight to take on enemies that have a weakness to their particular element. The element strength/weakness system works much the same as pretty much every game so I won’t go into the intricacies. 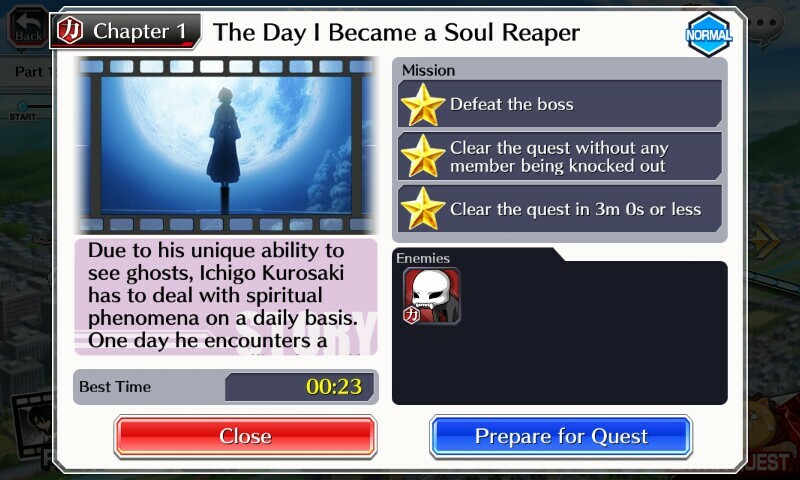 Each episode will cost you one “Soul Ticket”, which can be earned or replenished over time, and will give you three missions to complete in order to be awarded three stars. These stars in turn earn the player a “Spirit Orb,” an invaluable in-game currency which can be used to summon new characters to use. As you take on harder quests greater rewards will become available. These can be in the form of stat crystals or new characters. Each character is assigned a star rating from one, being the lowest, to five, the highest. Five star characters are rare and take a fair amount of time to level and upgrade but the effort is worth the reward. 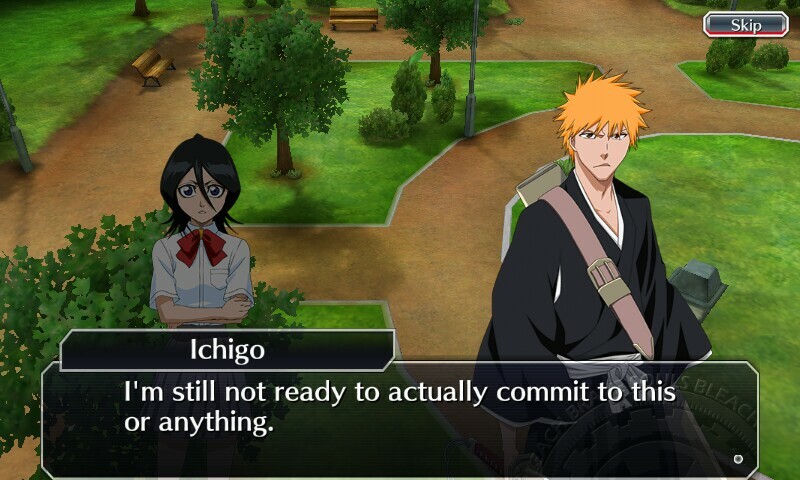 At the time of writing, Bleach offers over 170 episodes each taking between 3 and 5 minutes to complete meaning you could have anywhere from 7-15 hours of gameplay. If that wasn’t enough content for you (remembering this is a free mobile game) then I have good news: there’s more. In addition to the story, Bleach offers a Battle mode and a Co-op mode where you can test your mettle against, or with, other players from around the world. 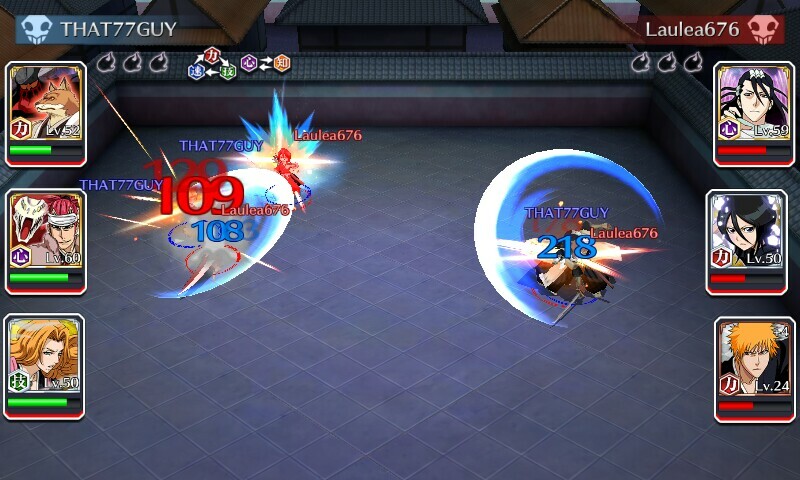 Battle mode is rather straightforward in that your best three characters fight your opponent’s best three and the better man generally wins. 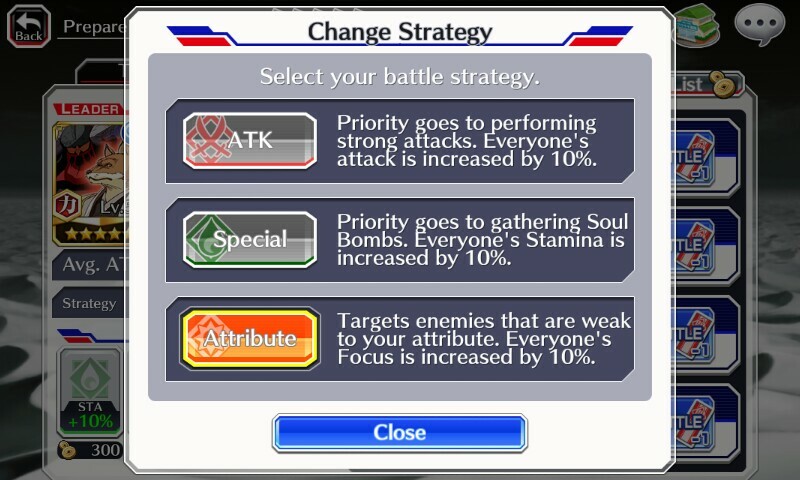 Every fight starts with a planning phase in which you can select your fighters and set one of three tactics for the battle – Attack, Special and Attribute (further detail provided in image). Once this phase over there is no more action required of the human and you simply sit back and watch the fight. Teams’ overall statistic will determine the outcome of the fight and the strategy you have in place may be the deciding factor. There are three leagues that work on a promotion/relegation system, each league bringing with it greater rewards to those that perform. Beginning at Seat Officer, promotion through the rank of Lieutenant and then finally Captain is fairly easy. I haven’t focused a huge amount of time toward this mode but I have managed to gain promotion to Captain League in the minimum time of two weeks. Once a week promotions and relegations are carried out and you’ll want to be climbing that ladder as with promotion comes the reward of a Rare Medal which can be used to redeem high level characters (5-star characters). Co-op mode gives the option of taking on quests with others online by either creating a room for people to join or by joining a pre-existing room. 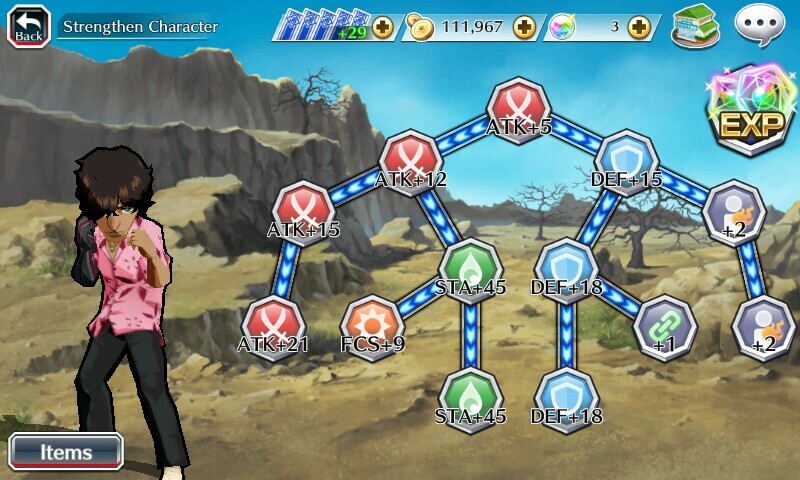 This mode seems to be the only part of the game I can’t seem to get to work. It’s a frustrating mix between finding a game and then trying to finish the quest without it timing out. A small update should stabilise this feature in the not too distant future. Players should be prepared for the sheer size of this game, coming in at over 1GB you will need to ensure there is sufficient space firstly, for the game and secondly, for the large, regular updates that are provided. 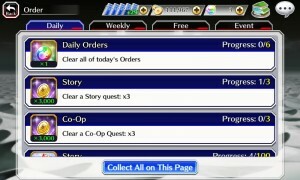 Additional features Bleach provides include a daily log-in bonus and Orders/rewards that can be obtained by completing a set objective. 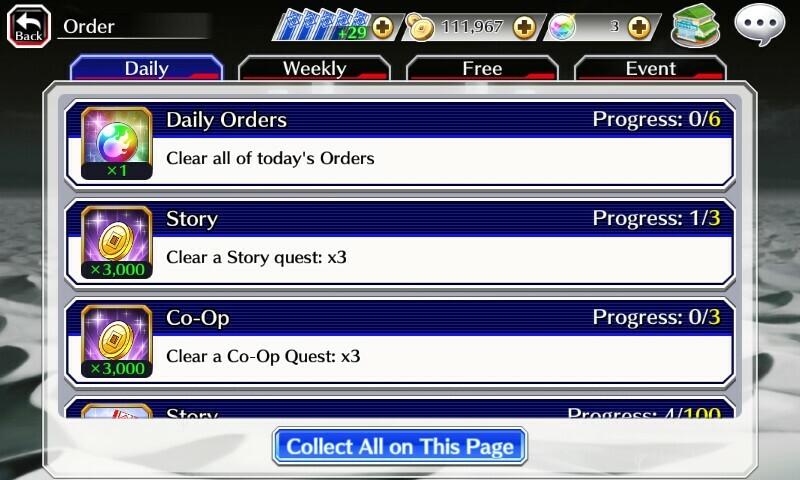 These Orders are broken down under the categories of Daily, Weekly, Free and Event. 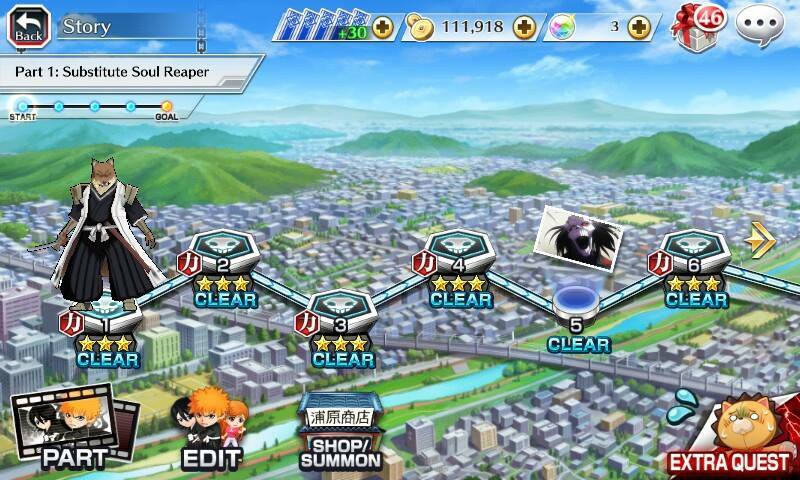 As well as the main quests Bleach offers time-limited Extra Quests that refresh on a regular basis. The game is impressively stable, running smoothly on my Samsung Galaxy Core Prime (which is a terrible piece of hardware) but you may experience a crash with prolonged play. Even after I’ve explained it so well? 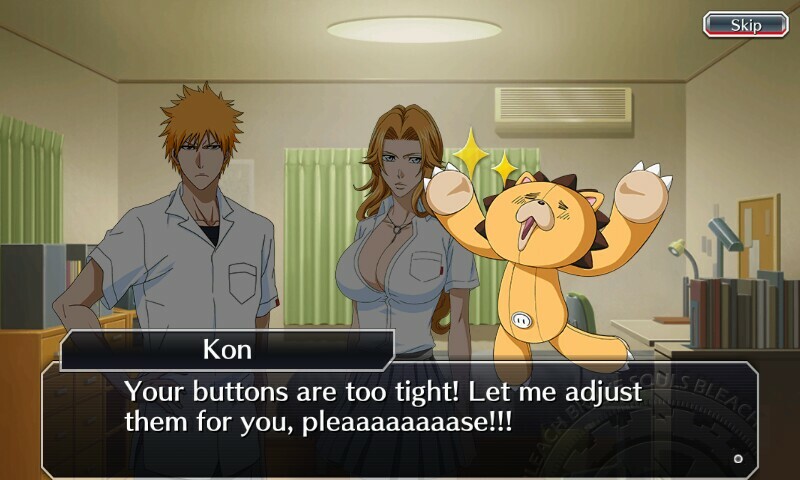 Probably my favourite feature of Bleach is the Summoning system. For the small price of 25 Spirit Orbs you can summon another character with a chance to receive anything from 1 to 5 stars. Further, if you save your pennies you can summon 10 for the bargain price of 250 Spirit Orbs (Wait, that isn’t a bargain at all!) with the guarantee that you will receive at least one 4-star character. Each character has their own special traits and the artwork on each character card is very well done. It’s clear that a decent amount of time and effort has gone into creating this game. As I mentioned previously, it’s made even more impressive due to the fact it’s “free” (Hang on, you didn’t put the word free in quotation marks before). 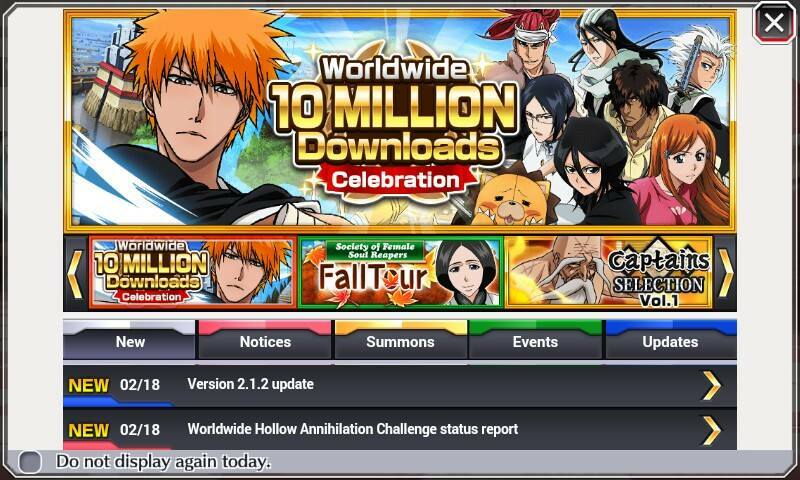 Yes the game is free to download and yes you can play all modes and access all content for free however, your ultimate success (in battle mode at least) will most likely require you to spend a bit of coin (to buy spirit orbs) to get some higher level characters. 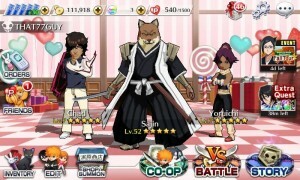 For a free-to-download mobile game, Bleach: Brave Souls offers an impressive array of content that will keep you entertained for longer than it has any right to do. The gameplay is basic but serves its purpose and the story is surprisingly enthralling with a fair bit of humour thrown in for good measure. If you’re anything like me, after playing Brave Souls you will be loading up The Pirate Bay to get in on some Bleach anime action as soon as you can. Bleach can be downloaded for Android and Iphone users via their respective apps.